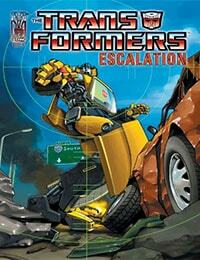 The Transformers: Escalation Average 0.00/5 - out of 0 total votes. The saga of the Transformers' secret war on Earth begun in The Transformers: Infiltration continues with Phase Two: Escalation. With the monumental menaces of MEGATRON and Ore-13 looming, the AUTOBOTS could be forgiven for thinking things couldn't get much worse. But, as OPTIMUS PRIME musters his response to the mounting threat, the Machination strikes with shocking and tragic consequences!